Decoys attract wild turkeys, but sometimes suspicious toms hang up. To motivate a dawdling tom, equip your decoys for movement. Archery turkey success is a game of inches, and the bob of a decoy could seal a tom’s fate. Any decoy on a stake system will move in the wind. Unfortunately, we’ve all hunted on mornings without a breath of breeze. Combat calm wind conditions by affixing a length of stout string or heavy-duty fishing line to any decoy mounted on a motion stake. If a turkey hangs up, simply tug on the string lightly to make the decoy swivel or bob. Turkey experts at Avian-X manufacture the Lifeline 360, a stake with a pulley system to rotate most newer decoys, including strut models. Practice the “tug” ahead of time as a wild jerk could spark fear instead of curiosity. And if you hunt from a blind, make sure the string has a clear path along the ground and doesn’t tangle in roadblocks. If you have a flush bank account, then look at turkey decoys designed with movement technology. The Primos Killer B tom raises and lowers its tail with the pull of a cord. This dominant gesture infuriates alpha toms. MAD’s Spin-N-Strut decoy also raises and lowers its tail with a tug, and it will rotate a full 90 degrees as well. Another great option is the new Mating Motion Pair from Dave Smith Decoys. This two-decoy system (video below) features a DSD jake attempting to balance on top of a DSD receptive hen; you control the jake’s movements with a cord. For states that allow electronic decoys, consider Mojo Outdoors Shake-N-Jake motion turkey decoy. 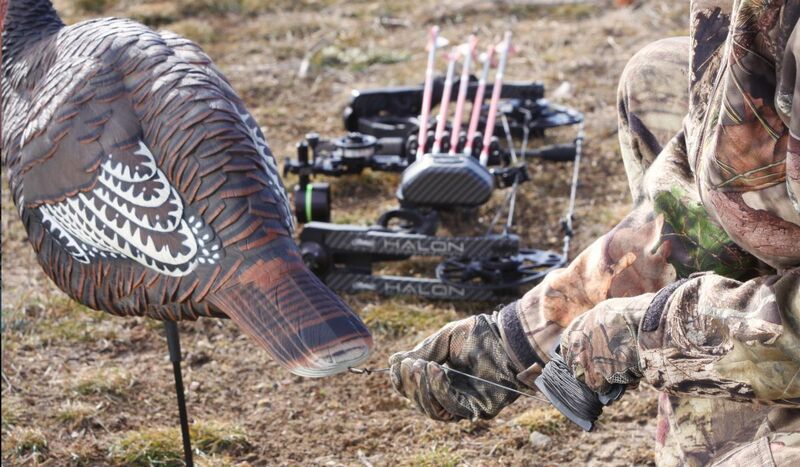 A remote control allows operation of the decoy from 150 feet away, but you’ll want to be closer when the tail and body motion mesmerizes a gobbler into bow range. Lastly, you can make your decoy dance. Bow-mounted decoys such as the Heads Up Tom Turkey and the Ultimate Predator Turkey Decoy (photo right; Eastern and Merriam models available) give you the ability to manipulate movement with the simple twitch of your grip. Editor’s note: Moving decoys are deadly for fooling wary turkeys, but they can also trick other hunters, too. Always be careful when using turkey decoys, and if you see someone approaching your setup, quickly identify your location in a loud voice. Sure, you might spook a few nearby turkeys, but it’s better to be safe than sorry.